The UK Government is moving in the right direction towards a more “pragmatic and sensible Brexit”, Ireland’s Foreign Affairs Minister has said. Prime Minister Theresa May published details of how Britain wants to see its future relationship with the European Union on Thursday. The long-awaited white paper containing 104 pages calls for a free trade area and common rules for goods. Simon Coveney welcomed the latest Brexit plan but said there are a number of “contradictions” and proposals that will concern other EU member states. He recognised the “difficult week” inside Downing Street following several resignations in response to the proposals agreed at Chequers. Mr Coveney said that difficult negotiations lay ahead but that the Brexit process has moved from the “politics of parliaments” to the negotiating rooms of Brussels. He raised concerns, however around the UK’s position on access to parts of the single market which has been ruled as red line for EU’s Brexit taskforce. “There are some contradictions, there are now proposals that will concern some other EU countries because the single market and the four freedoms that are part of that, are a very important part of the privileges of EU membership. “That’s why it will be a difficult negotiation,” he said. “I don’t necessarily think because the British position has changed and has become much more credible, that it’s the final picture, but it’s important to recognise progress. 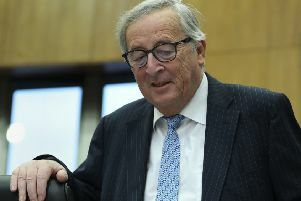 “The EU side have always said that if Britain soften their red lines then the EU would respond to show some flexibility, so let’s test that in a negotiating room. Some seven weeks of talks lay head for EU lead negotiator Michel Barnier and the British Brexit team. The white paper also stated that the withdrawal agreement will need a backstop agreement but indicated that it will never be needed. Mr Coveney added: “The British position now is that the way to deal with the backstop is to agree a comprehensive set of negotiating perimeters by the end of October along with the text of the withdrawal treaty to reassure people that while the backstop is there, it will never be used. “That new direction has been a step in the right direction towards a pragmatic, sensible Brexit that allows the EU and the UK to trade with each other in the future in a way that works for everyone as opposed to a policy that is written by an ideology or hardline thinking. “The ambition coming from the British government to try and have a future relationship that doesn’t require any border infrastructure between the UK and EU in terms of goods and agri-food, that is one that needs to be developed through detailed negotiation. Taoiseach Leo Varadkar said that he will read the policy papers over the weekend before making a “considered response”. “I do welcome the fact that it has been published, it’s two years since the referendum in the UK, it is welcomed that at long last we have a white paper from the UK explaining how they see the new relationship with the EU and the UK and I look forward to reading it and giving it a considered response next week,” he said. “But one thing that won’t change are three objectives when it comes to Brexit talks. “First of all, protecting the Common Travel Area so people can continue to travel freely between Britain and Ireland. “Secondly making sure there is no hard border and trying to minimise any negative impact on trade between Ireland and Great Britain.